I prefer it if Visual Studio opens up each time to show the project I've last been working with (a separate blog covers how to load recently used ASP.NET websites). Here's how to get this to work! 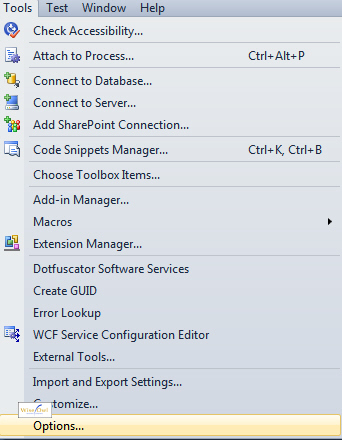 From the Visual Studio 2010 menu select the menu option shown here. Choose to change Startup optons. Click on the drop arrow to load the last solution you've been working with. Untick the box to avoid downloading content from the Microsoft news channel every hour! When you leave Visual Studio and go back in, you should automatically see the website or other project you were last working with loaded.